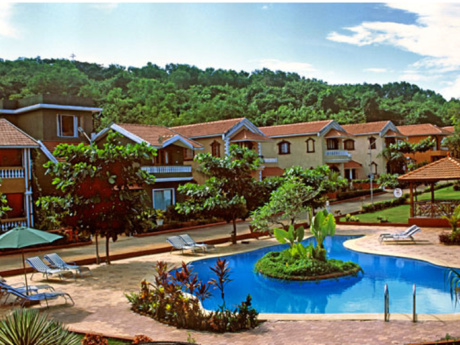 Little Siolim is conveniently situated on a hill slope as you enter the quaint village of Siolim. Siolim is centered 15-20 minutes from the tourist beaches of Candolim, Calangute and Baga on one side and the quiet beaches of Morjim, Ashwem, and Harambhol on the other side. The closest beaches are Anjuna, Vagator, and Morjim (within 15 minutes). The famous Arpora Saturday Night Market is only 4 km away on the same road as Little Siolim. Its location makes it the perfect exclusive yet accessible experience. Little Siolim has been designed from two 100 year old Portuguese houses that have been combined to form one luxurious house. The house is inspired by Siolim House and created by the same family. It gives guests the experience of living in an ancient house with the comforts of a modern home. The architecture and design is an amalgamation of Portuguese, Sri Lankan and South East Asian designs created by the owner himself. The swimming pool set in the courtyard of the house offers a private experience of swimming while gazing at the spectacular view of the stars. The entire house centers around the pool as the living room and the 3 bedrooms are situated around it. The pool continues into the living room inviting you to take a dip at any time. The living room also has an open kitchen which is fully equipped with all modern amenities for cooking up that delicious meal. You can choose to cook yourself or opt for a cook which is available on request. On the other side is a verandah which overlooks the side garden. The entire property is surrounded by gardens on 3 sides along with a patio in the front of the house; another place to enjoy that cup of local tea. All rooms have high ceilings, including the bedrooms. The master bedroom with a four poster bed has a wooden floor, the wood of which is a 100 years old and is from the two original houses. The attached bathroom is large and has an almost roman style bath built for 2. It also includes a private garden and veranda. Bedroom 2 is furnished with teak wood furniture including a boat shaped bed imported from Bali, a 32 inch LCD TV and a completely white bathroom. Bedroom 3 with a direct view of the pool has a unique outdoors bathroom which includes an open-to-sky shower and bath. This bathroom also contains the original well of the house and still operates today as a source of water for gardening. 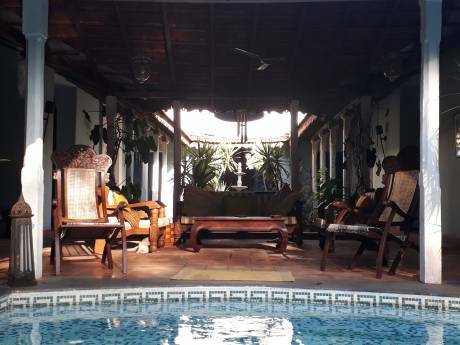 The theme of Little Siolim is Mangoes and Coconuts which is why the house is painted a rich yellow and the pillars lining the veranda and pool are all made of coconut tree wood. The perimeter of the house is lined with coconut trees and the garden includes lavish fruit bearing mango trees. Little Siolim is the perfect place to have an exotic retreat or romantic getaway. You can enjoy your morning breakfast (included) facing the garden at the side of the house or in the front of the house where you can watch the world go by. The house can comfortably fit anywhere from six to nine people. Our staff is very warm and friendly and will make sure that your stay at Little Siolim and Goa is the perfect get-away. 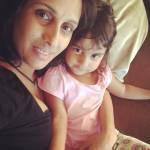 Family of 4 who loves to travel. Artist and Dancer Mother looking for inspiring places to create. Born and Brought up in America, Asia-based for the last 10 years.